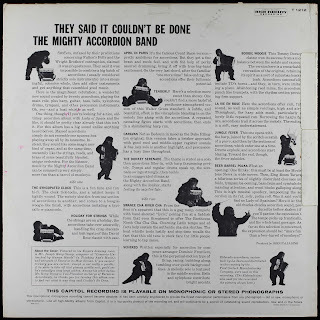 Music for Maniacs: The Mighty Accordion Band - They Said It Couldnt Be Done! The Mighty Accordion Band - They Said It Couldnt Be Done! 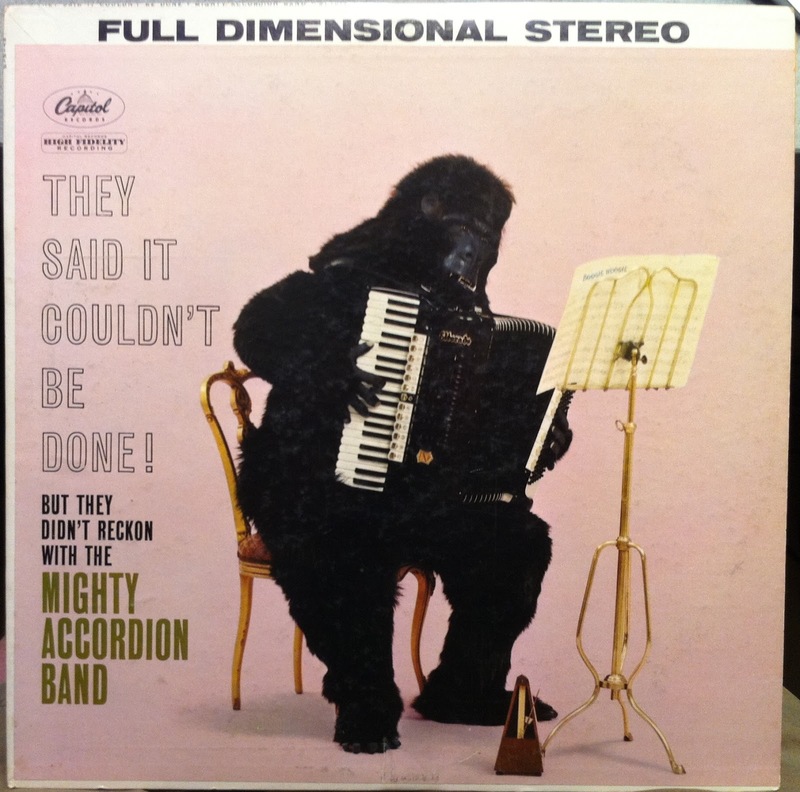 Apart from having one of the all-time great album covers (pretty obvious why I snatched this one up for a mere 99 cents at my local charity thrifty emporium), The Mighty Accordion Band 's "They Said It Couldn't Be Done!" is an excellent listen. 20 - count 'em - TWENTY squeeze-boxes playing together creates a unique symphonic sound that ranges from exotica (the Les Baxter soundalike "Jungle Fever") to finger-snappin' jazz, dreamy ballads (great version of "tenderly") and swingin' big band. Pretty much everything but polka. I especially like the bizarre cha-cha version of "Swanee River." Perhaps their taking a corny old tune that no-one was playing anymore and giving it a hip new Latin spin was equivalent to all those New Wave covers of classic rock songs I posted a while back, e.g. : Devo's dismantling of the Stones' "Satisfaction." 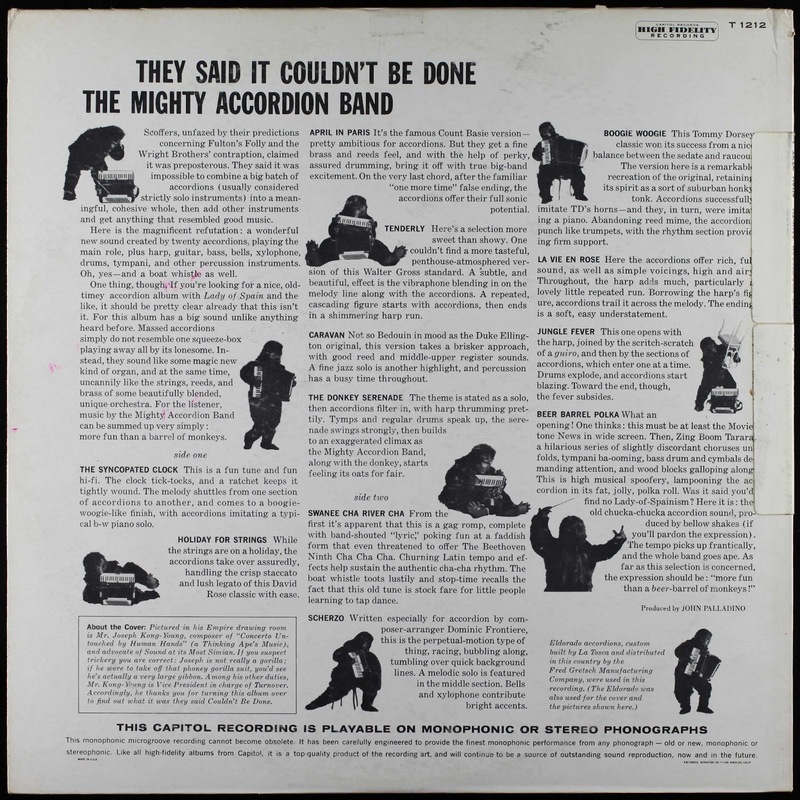 Did The Mighty Accordion Band record the first ironic cover?! Dominic Frontiere is credited as the mad genius behind this project. Hey, I know him! He became a top film soundtrack composer, his "Hang 'Em High" theme being one of the best Spaghetti Western themes.